REDD means Reducing Emissions from Deforestation and Degradation. 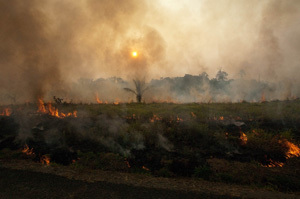 In recent years, the impact of tropical deforestation on climate change has taken center stage at climate talks and in international negotiations. 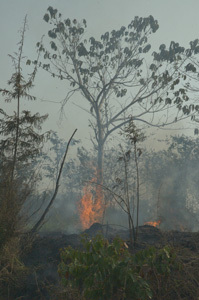 It is estimated that burning forests contributes between 12 to 20% of carbon dioxide emissions globally (depending on the annual quantity of other types of emissions). That's more than the entire global transportation sector! This means that if we can protect forests, then we can reduce global CO2 emissions by almost one fifth. Keeping mature forests intact is a critical part of slowing climate change. What is a REDD carbon offset? If we can measure the deforestation rate, and we know how much carbon the forest is storing that would become carbon dioxide if it was cleared or burned, then we know roughly the quantity of emissions that would be released under normal circumstances. We can then turn these carbon measurements into tonnes to be sold on the voluntary market, using the funds to change the status quo and address the issues that are threatening the forest in the first place. In the 30-60 years that it takes for a seedling to reach maturity, most mature forests will be lost due to slash and burn agriculture and poor land use choices. If we invest in preserving what we have now, we will not only prevent more CO2 from entering the atmosphere, we will protect biodiverse habitats, water supplies, and natural resources for future generations. Avoiding deforestation is something we can do right now that has an immediate impact. Reducing emissions is only part of the picture. Just paying to offset emissions by locking up forests will not help to create the sustainable relationship between man and forests that is needed to create long term conservation. REDD projects must consider the rights and traditional forest usage of indigenous and forest dependent people, allowing for sustainable community development compatible with forest conservation. A well-designed REDD project must have the support of local communities, holding indigenous rights and biodiversity conservation as a top priority.